‘Superantigens’ – (coined by Kapplar and Marrack in 1990) are a class of antigens which cause non-specific activation of T-cells resulting in polyclonal T cell activation and massive cytokine release. They are produced by pathogenic microorganisms, including viruses, mycoplasma, and bacteria as a defense mechanism against the immune system. Compared to a normal antigen-induced T-cell response where 0.001 to 0.0001% of the body’s T-cells are activated, these Superantigens are capable of activating up to 20% of the body’s T-cells. 1. They are not processed into peptides and associate with the MHC Class II molecules outside the polymorphic peptide-binding groove. 2. Although they require MHC Class II molecules for presentation, the T-cell response is not MHC-restricted and superantigens can be presented across species barriers. 3. Superantigens interact with T-cell receptor over the Vβ segment only, regardless of third hyper variable regions and Vα expression. By the action of superantigens, the T-cells are stimulated and produce excess amounts of cytokine resulting in cytokine-mediated suppression of T-cells and deletion of the activated cells as the body returns to homeostasis. If the initial inflammation is survived, the host cells become anergic or are deleted, resulting in a severely compromised immune system. Superantigen stimulation of antigen presenting cells and T-cells elicits mainly inflammatory responses focused on the action of Th1 T-helper cells. Some of the major products are IL-1, IL-2, IL-6, TNF-α, gamma interferon (IFN-γ), macrophage inflammatory protein 1α (MIP-1α), MIP-1β, and monocyte chemoattractant protein 1 (MCP-1). This excessive uncoordinated release of cytokines, (especially TNF-α), overloads the body and results in to rashes, fever, and can lead to multi-organ failure, coma and death. They are also known to play a role in allergy and autoimmune mechanisms. Superantigens can be broadly classified as exogenous – comprising bacterial toxins and endogenous -comprising virally encoded superantigens. 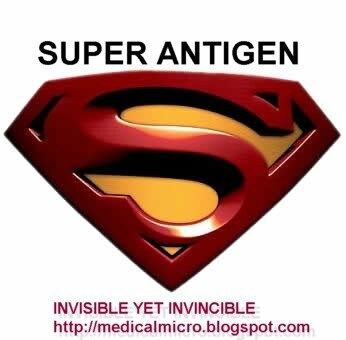 Endogenous superantigens have not been identified so far in humans. Depending on the toxin, supportive therapy and antibiotics are administered. Pooled intravenous immunoglobulins are used to treat TSS. Superantigens have been implicated in the treatment of cancers and more studies are directed to explore further applications of superantigens in therapeutics.